Payroll Mate® makes processing construction payroll easy and affordable. Our payroll system offers many features that can cater to the special payroll processing needs of Construction and Contracting businesses. Since Payroll Mate® allows you to create unlimited custom income categories, you can ensure your employees are paid based on the job they perform. 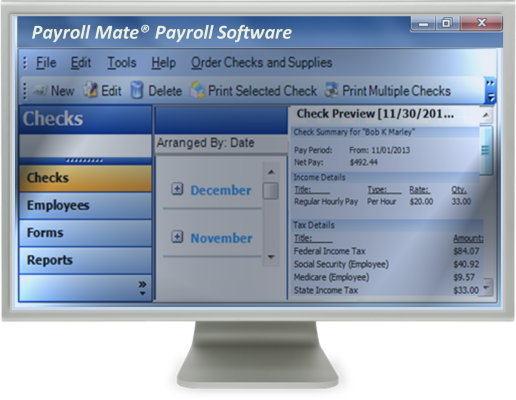 Payroll Mate comes with the ability to pay construction workers, print checks with paystubs, handle union pay, calculate payroll by job, track hours (regular, overtime, sick, vacation), figure fed / state taxes, support fringe benefits and integrate with accounting systems such as Sage 50 and Intuit QuickBooks. If you run a construction or contracting business, you may not have a lot of time to process your payroll. With all of the responsibilities associated with owning your own business, why not take advantage of a tool that can make processing payroll easy for you? Payroll Mate® is a great solution to turn to. This software ensures that you can process payroll in a timely manner and still have the time and energy to invest in the other responsibilities you have while running a construction or contracting business. Pay frequencies include: daily, weekly, bi-weekly, semi-monthly, and monthly. Pay types include per piece, hourly, commission, and many more. You also have the ability to custom create unlimited income, tax, and deduction categories. If you need to enter notes for a specific employee, Payroll Mate® provides you a special place for this under the employee’s information wizard. • When operating your own construction or contracting business, you most likely have a lot of contractors to deal with on top of your regular employees. With an additional cost add-on feature to Payroll Mate®, contractors and 1099 Recipients can be easily supported. Simply set up your contractors or vendors, print and track vendor payments, generate reports, and print IRS tax forms 1099-MISC and 1096. • Dealing with quarterly and annual payroll forms can be a very important yet stressful part of processing payroll. • To avoid problems, Payroll Mate® can make pulling these forms easy. Federal forms include 940, 941, 943, 944, W-2 and W-3. With the forms ready to sign and send, you can ensure you don’t waste a day getting them ready. • Setting up Payroll Mate® is very easy since the program provides you will step by step wizards to follow. If you need further assistance beyond these wizards, you can look to our helpful Tutorials section. Friendly customer service is also available via email, live chat, and phone. • Friendly customer service is available via email, live chat, and phone. • Simply set up your company’s general information and employee’s to get started with creating payroll checks. Payroll Mate® automatically calculates State and Federal withholdings, Social Security, Medicare, and the net pay. If you have workers who get sick or vacation time, you can easily administer this with Payroll Mate®. Signature ready checks are ready to print with a few simple steps. Pay stubs can be printed for your employees or also emailed. • With Payroll Mate®, you can run reports with a few clicks of the button. You can run reports such as Employee Earnings, Taxes and Deductions, Payroll Journal Detail, Tax Liability, Deposit Requirement, State Taxes, and many others. You can also easily print these reports or send them by email. • Once payroll is complete, you can export your data to accounting software applications such as Peachtree Sage 50, Intuit QuickBooks, General Ledger, and Quicken. • To ensure your data is always accessible, the program offers an easy backup and restore feature so you can easily recovSer lost data if needed. • Making sure your payroll software is compatible with your computer is a very important feature. You are in luck with Payroll Mate® as it works with all modern Windows operating systems. • At the same time, if you have a Mac, you can easily use this program. All you have to do is use virtualization technologies such as Oracle Virtual Box or Parallels Desktop. • When running a construction or contracting company, you will have a lot of important data on your hand. You can ensure your data will always be secure by using the option to password protect your login. You can also mask your employee’s Social Security numbers on printed pay stubs. As you already know, there are many responsibilities when running your own construction or contracting business. If you are looking for an easy to use payroll processing software for your employees or contractors, Payroll Mate® is your answer.